If you are looking for a review of all the best table saws in the UK, you have found the right place. We review all the latest and best table saw models on the market, to give you peace of mind that you will be choosing the right product for you. Below, in the table, the table saw reviews start with the most highly rated first, then descend accordingly. For people who are in a hurry, you can use the table. For people who want a more in-depth review, you can scroll further down the page, where we provide all the pro's and con's for each. Occupying the top spot of this best table saw UK ranking of ours is the classical and every powerful Evolution RAGE 5 S Multipurpose Table. The evolution RAGE 5 S is known for its accurate delivery and comprehensive nature. This table is one of the most sought after table saws in the market today. Possesses a blade guard that has a dust extraction port on it. This table saw comes with one dust extraction hose and a mitre gauge. It comes with blade changing spanners, a push stick and an instruction manual. Looking at the reviews and ratings of customers who have used this table, one can say that the comprehensiveness in terms of features is what makes this table notable. This table offers the user virtually all that is needed to operate and maintain the table saw. The saw is made of the Japanese tungsten carbide blade that makes the blade a solid one capable of cutting through steel, wood, aluminum and other materials. With its 1800 Watts gearbox and blade system, this table saw is a powerful saw suitable for all cutting tasks. The adjustable, full-length fence of this table saw makes it easy for one to make accurate cuts from all common angles possible. Has all the tools needed to keep the saw in an excellent working condition? The major drawback remains that it only works well as a domestic tool, not a site tool. Coming second on this best table saw review ranking of ours, is the Bosch Professional GTS Corded Table. This table saw is known for its compact nature among users making it one well desired. Asides from this, it is also known to be a very portable table saw that fits in well for a mobile workshop or a workshop that doesn't have a considerable space. Comes with a self-adjusting parallel guide that allows for precision while cutting. Including a cutting measurement of about 79 mm in height, 460 mm to the right and about 210 mm to the left of the blade, it is quite impressive. Excellent and compact design, reliable and durable delivery. Has an excellent price to ratio quality and one of the best you can find in the table saw market. The dust extraction ports of this table saw, and its location remains a stand out feature. The dust extraction enhances the workflow of the user as dust is being taken away from the table while working. With these dust extraction port's, you are always to save some time while working on a cutting project. The adjusting parallel guide gives it an edge over many other table saws. Compact design helps to enhance the look of your workshop even when not in use. It is quite challenging to handle tough and large cutting projects with this saw. This fact means that one might have to purchase two table saws to get all the required woodwork done. The third table saw on this top ten list of ours, is the Compact Job site Table. As the name implies, this table is a very compact and straightforward to use a table saw. It is qualitative in that it is made with the best materials, comes with an excellent design and is very affordable. This table saw has a weight measurement of about 22 kg unit. The safety of use that is assured when making use of the Compact Job site table remains one, if not the main reason why many users prefer it. Its additional features and attachments make it easy for the workload to be secured at all times while in use. The quick bevel lock it possesses that allows for adjustments while working thereby enhancing accuracy. With a relatively lightweight, and the personalised footprint, this is the most portable table saw in the market. With the fence system, you can work on larger projects with this table. The warranty plan though provided, is not so comprehensive enough. This Fox model table saw is the newest version of the Fox series. With the many upgrades that have been installed to the previous versions by including many amazing features. This table saw makes its way to our top ten tables saw ranking as the 4th. This table saw has two adjustable and removable side extensions on both sides of the table. A heavy duty leg stands that enhances accuracy with the aid of a laser marker. It has a maximum capacity of 80 mm at 90 degrees and 55 mm at 45 degrees. Many people find this table saw quite appealing and choose it above other table saw because being a new model it has an attractive design. Aside from this design, much improvement has been made to this Fox model in terms of features making it more functional than the previous ones. The accuracy of outcome is what any woodworker or homeowner is making use of any table saw looks out for in a table saw. To this end, the heavy-duty legal stand of this table saw remains its standout features as it uses a laser marker to ensure the accuracy of the result. It has robust press steel and ribbed cast aluminum which makes this table saw very durable. The side extensions can be removed and adjusted to suit the task that is at hand. cleaning up after this model is a must, because it comes with no dust extraction port to hold on to the dirt. The 5th table saw pick on this ranking of ours, is the Charnwood W619 Sliding Carriage Extension which is a comprehensive table saw. This table saw is a very reliable, budget-friendly and still highly durable table saw suitable for woodworkers and homeowners. The floor stand base also makes it easy for users to work comfortably on the table at all times without any fear of falling off while in use. Asides from the compact and high-quality nature of this table saw the quiet induction motor remains the standout feature. Not only can you effect the best cuts with this table saw, but you are also able to enjoy a serene atmosphere while doing so. It comes with a quiet and easy to use induction motor. The solid floor stands base gives the table a whole lot of balance. The weight of this table saw still poses a significant challenge for users. When you think of a table saw to deliver high performance in the most precise way, then look no further than this number 6 pick on this ranking of ours. Triton TWX7CS001 Contractor Saw Module is a table saw from a very reliable brand that offers the kind of precise cuts you have never seen before. Precision is the most important reason why people like and choose the table saw above many others in the market. Its precision level is so high that some people make it one of the many other table saws they have, but look up to it for the most precise cuts. The standout features of this table saw differentiates it from other table saws and all credit goes to the brand. These features include the 1800 Watts motor it possesses as well as its 254 mm TCT blade that aids precise cuts. It also has two dust extraction port's making it easy to get specks of dust out from the table saw. Comes with a solid blade guard that assures safety while in use. One of the best saws for professional cutting projects. Not just easy to use, but also easy to store and maintain. The table is quite large and causes discomfort in a small workshop. The Evolution FURY 5-S 255 mm multipurpose table saw is our number 7 pick because of how much suitable it is for any workshop. It is best for various types of cuts including cross cuts, angled cuts, mitre cuts and others. The main reason why people like it is because of how well it can utilise patented evolution multipurpose cutting technology in cutting non-ferrous metals and materials. Ability to instantly cut mild steel leaves. The removable and adjustable rip fence is strong enough to assure the security of use. Anti-bounce device lessens material movement to enhance precision. Doesn't require any technical know-how or professionalism to operate. Has an inferior dust extraction system when compared to other tablets saws. Occupying the 8th position on this best table saw UK ranking of ours, is the Einhell TC TS-2025 Table Underframe. Are you a homeowner who make cuts and is not aware of this table Underframe? Then you are missing out on one tool with amazing features and excellent delivery. The saw blade guard that secures safety comes with a chip extractor connection. Also included I'd a parallel stop that makes accurate angled cuts possible. Possesses a housing that has chip extractor to ensure a clean workspace. The Einhell has holders for both the power cord and other included tools. Though having many amazing features exclusive to itself that makes it attractive, the sturdy base frame of this table saw is still the main reason why people like it. This sturdy base frame makes the table comfortable to work with at any height. The standout features of this table underframe are the quality of its TCT saw blade and the side extensions it comes with on purchase. However, coming with a 2-in1 blade height and angle adjustment is a feature this table saw possess that you won't find in many others. You need to get your budget straight and high to land yourself this table saw. As a homeowner, are you looking for a very reliable, super powerful and versatile tool, then all you need is the VonHaus 1800W Underframe table saw. With VonHaus already establishing itself as a reputable brand, trusting this product becomes easy. With an adequately sized dust collection port, the efficient collection of this table saw is the main reason why people like it. Allow for attachments like a vacuum cleaner, dust, debris and dirt are easily collected. The carbide layered cutting blade which is responsible for its high performance. This table saw allows you to not only make angled cuts but also to be able to make longitudinal cuts on various wood types. The adjustable height, angle and powder coated table of this saw are additional features that stand it out from other table saws. The adjustable height and angle allow you to make use of the table saw for any cutting project size. It is reliable, has efficient dust collection and an excellent price to quality ratio. Since it comes with a powder coated table, it can last a long while without any tear or wear of any kind. Its durability comes under threat after a while of use. The 10th but not the least table saw we picked is the Lumberjack BTS210 Bench Hobby. This is a top table saw that had been specially designed for mobile use. Though with a little storage space provided, this table saw is very compact and a powerful cutting tool. Are you a DIY home woodworker? Then this is the best top table saw for you to use in making all types of accurate cuts. Measures about 585 mm in length, 455 mm in width, and 340 mm in height. It has a cutting depth of 48 mm at 90 degrees and 45 mm at 45 degrees. There portability of the tool which makes it easy for homeowners to move it from one place to another us a primary reason why people like it. Its ability to make precise angled cuts and suitability for DIY purposes are also reasons why people like it. Stand out features of this Lumberjack Bench Hobby include the presence of a string TCT blade and a safety blade guard which is necessary to ensure the user's safety. It also has a mitre gauge and a rip fence that is removable and adjustable coming along with it as well. Elegant, highly mobile and super compact table saw. Though small in size, it is compelling in its operation. Comes with foldable extension tables making it easily adjustable depending on work to be done. Has inferior storage space making it difficult to work with for larger projects. With this review of the best table saw UK, it is inevitable that you can see all of the saw tables provided and know which is best for you. However, before choosing, it is imperative that you take note of its specifications and unique features. This not only helps you go for a table top saw suitable for the job but ensures you are going for the best. For further readings on the best table saw for sale, you can read many other tables saw reviews UK as a comparison to this one. Also as a side trick to weigh the performance of each table saw, is to read what customers are saying about each. Customer ratings and reviews no doubt influence many tables saw reviews, and their selections of the best table saw. The Evolution RAGE5 S Multipurpose Table is no doubt an excellent pick for you considering its versatility and effectiveness. The cutting capacity and bevels of the table saw. 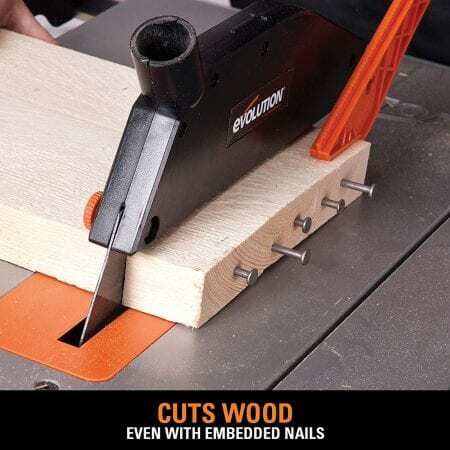 This fantastic feature helps you to know how well the table saw can make maximum cuts at certain degrees. Also, make sure the table saw you are going for has room for adjustments at various angles degrees. The quality of the blade determines the performance rate of the table saw. When buying a table saw, check for the depth at which the blade can be set for a cut. Also, check for our settings of the blade, and it’s fitting to the table saw. Don't leave out the blade guard and arbour of the blade to be sure it is stable. The motor quality and strength determines the speed of the table. So check reviews and ratings on the motor of the table saw to be purchased to be sure it is a quality one. The control the table saw provides, usually determines its strength in cutting through more robust materials. The visibility and Amps of the table saw should also be considered. Visibility here means the sight of the blade offered by the table saw through its window. This sight should be clear enough so you can access the saw's depth of cut. The Amp strength of the table saw measures its power. It is advisable to go for a table saw with high amps and volts at all times when buying one. The dust extraction tool provided for with the table saw. In some table saws, you should notice the presence of one dust extraction tool while to in others. You should go for a table saw with a large and durable dust extraction port to take away dust produced from the surface of the table while working. Generally, the features people find handy in a table saw depends on many things which range from the task it is needed for, down to personal taste. However, comprehensiveness, portability, durability and reliability are different features many users look out far. The compact design nature of some table saws is another feature people look out for when getting a table saw. The affordability of the table saw when the price is measured against the quality of the tool and its ease of use. Q: What is the difference between a table saw with two dust extraction ports and that with only one and which is best? A: When making use of a table saw on a wood piece, sawdust is produced as you saw through the wood. To effectively get rid of the excess sawdust, there is a need for dust extraction ports. While some table saws like the VonHaus table saw comes with a single dust extraction port, the Bosch Professional Table saw comes equipped with two. For efficiency, especially when working on large pieces, it is best to go for table saws with two dust extraction ports. Q: Is the product warranty offered by a table saw a factor to consider when buying one? A: It might not be explicitly stated as a consideration to make when buying a table saw, but it is necessary to give you trust in the product. When you buy a table saw with a comprehensive warranty plan, you are on a safer buying side than one who doesn't. This because you can report to the technical team to correct a technical default detected on a purchase. Q: Where can I make an order for the Einhell TC TS-2025 Table Underframe? A: While there are many online stores where this table saw particularly the Einhell model is available for purchase, Amazon is the best place to be to place your order. Amazon offers you the best products and also provides you with customer reviews on each product offered.